WHAT OTHER CLOWN GROUPS ARE THERE IN THE CAPITAL REGION? Glad you asked! Besides ECCA, the other clown alleys in the area include the Town Clowns, the Happy Valley Clowns, the Battenkill Joeys and the Capital Region Clown Arts Festival. You may belong to any number of alleys. Other clown arts groups in the area include the Joyful Joeys, the Telephone Pioneers Clown Troupe and Clowns On Rounds, Inc. There are also three Shrine Clown Units in the area. The Capital Region Clown Arts Festival provides refresher, intermediate and advanced clown arts education and training for all active practitioners of the performing art. The Greater Northeast Clowns, Inc. is a not-for-profit educational corporation charted by the New York State Secretary of State to provide clown arts education opportunities to the residents of New York State. The Electric City Clowns, Incorporated is the corporate not-for-profit arm of the Electric City Clown Alley. It hosted the 2002 COAI Convention in Saratoga Springs. It is chartered to bring forth clown arts opportunities to the residents of our local area. Here is "Rowdy"! 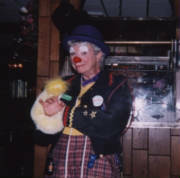 She was COAI's 2002 Clown Of The Year and an active member of the Happy Valley Clowns.